March « 2012 « How Do You Measure 525600 Minutes? Another day spent exploring and wandering the culturally rich and diverse streets of New York. Some neighborhoods that have survived more than a century are shrinking and others are swallowing them up. 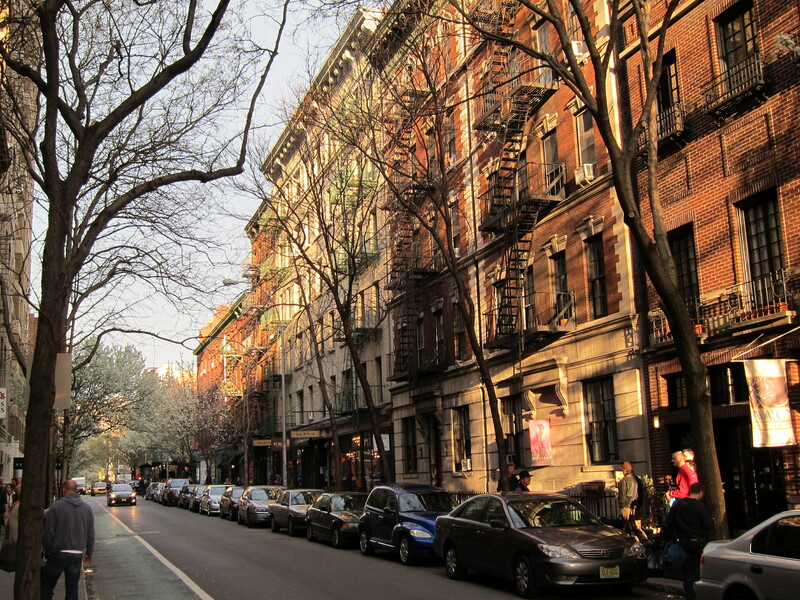 We took the subway down to SoHo in the morning and then walked around many of the historic neighborhoods. 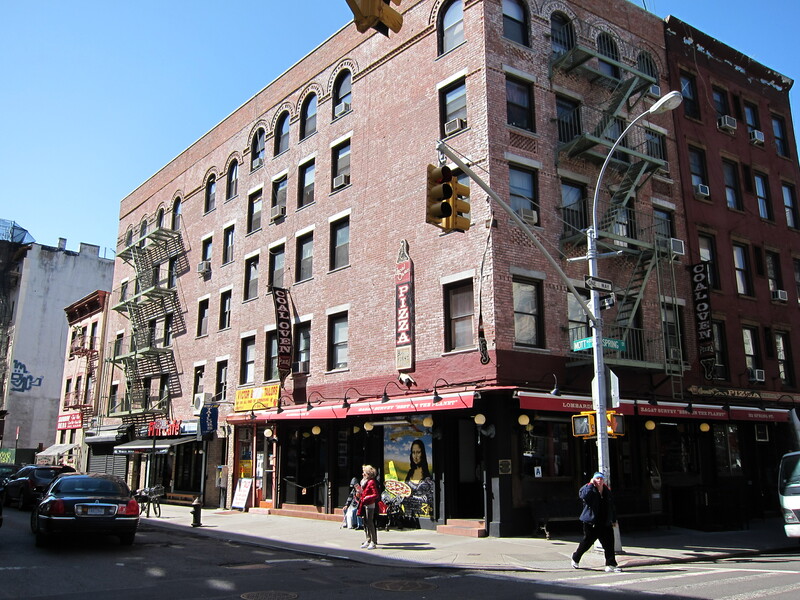 Little Italy is now only about three blocks long, having been overtaken to a large degree by Chinatown. I found it interesting to see representatives from each of the Italian restaurants, on the street, enticing customers to come in for lunch. This was done in a much classier way than what we’ve come to expect from street marketers. Keep in mind these are all white linen table cloth establishments, not fast food. We wandered out of Little Italy, into Chinatown and leisurely walked along Canal Street. Most tourist know Canal Street as the knock-off shopping meca. Not much has changed. Although, the strip we walked seemed less claustrophobic then I remember from the past. Stall after stall of scarves, purses and perfume. Jewelry and watches galore… but many people were offering to take you to secret rooms for most of the knock-offs. A few years ago they were out on the open street– everywhere. We had an enjoyable lunch, back in Little Italy at the historic Lombardi’s Coal Oven Pizza. It was very good. I have a fondness for New York pizza over Chicago pizza. I’ve never had bad pizza in New York. Lombardi’s was good but I still think I prefer John’s Pizza the most. A view of the High Line. After lunch, we stopped for dessert at a little shop called Rice to Riches, with an amazing array of rice pudding options. Who knew? Our target destination for the day was a relatively new attraction called the High Line. First, we explored the world famous Chelsea Market. Michael ended up buying an interesting array of handmade soaps there. The High Line was a unique and new find for us. 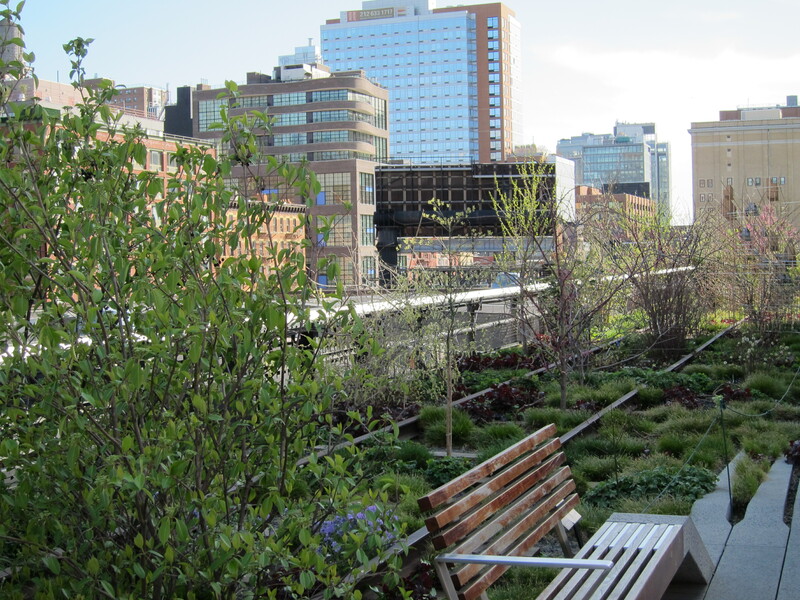 It is basically a reclaimed strip of historic, elevated freight train track, re-purposed as a park and green space. 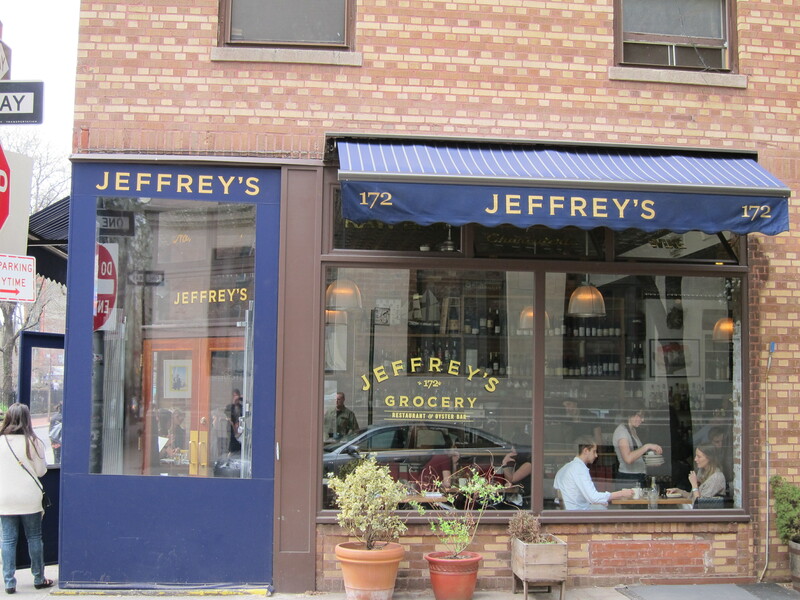 It runs from Gansevoort Street in the Meatpacking District to West 34th Street, between 10th & 11th Avenues on the west side. It’s an excellent relaxing alternative to Central Park with some excellent views of the city. There are spaces for concerts, benches for relaxing and viewing, and miles of peaceful walking. 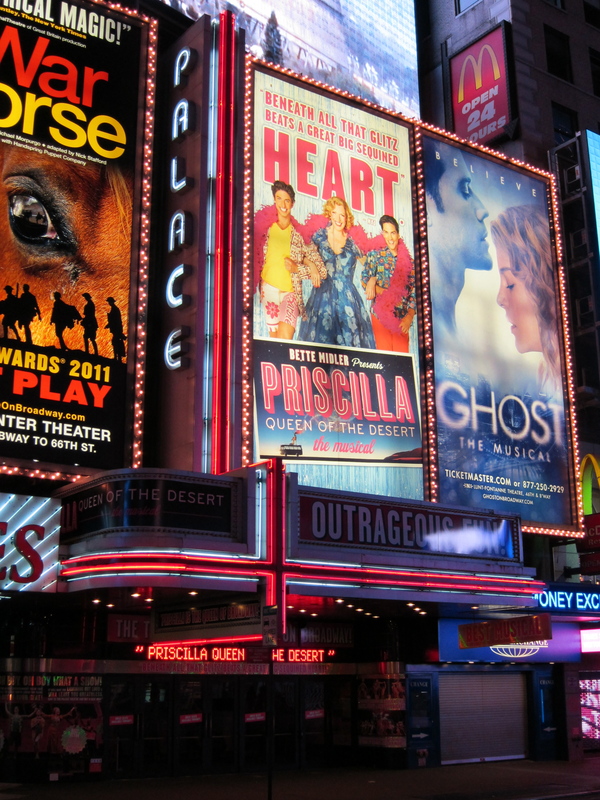 We headed back to the theatre district for our Tuesday night show, Priscilla Queen of the Desert. This was not a show we’d originally put on our list but after several friends had recommended it, we added it to our schedule of shows. Its been running for a while and we thought we should see it now rather than taking a chance of missing it, if it were to close before our next visit. My quote: “With a four foot mirror (disco) ball and flying divas… how can you go wrong?” Adapted from a movie of the same title, Priscilla is an entertaining production full of tunes from the 80’s and 90’s. It’s a jukebox musical– with a plot. High Art– it’s not. This is just pure, good, foot-tapping entertainment. I was surprised Michael and I weren’t exhausted after seeing 6 shows in the past two days (7 total to this point.) Plus, I frequently take naps when my schedule allows and I haven’t had one since we got here. It’s been a great trip so far and I was looking forward to doing a little exploring today. After I finished my blog post…in a very windy Times Square…. I caught up with Michael in Union Square where we’d planned to meet up with a friend. 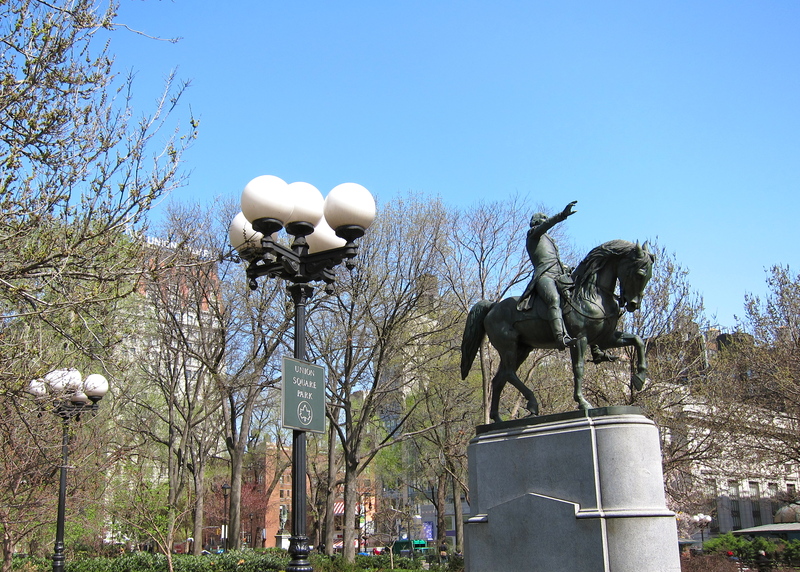 Union Square holds special importance on this trip as it is one of the locations featured in the musical, RAGTIME that I am directing. Emma Goldman gave speeches and held rallies here. Today, Occupy Wall Street is camping out, banging drums and holding signs of protest. A century later and not much has changed. Different cause — same location. Power to the people. 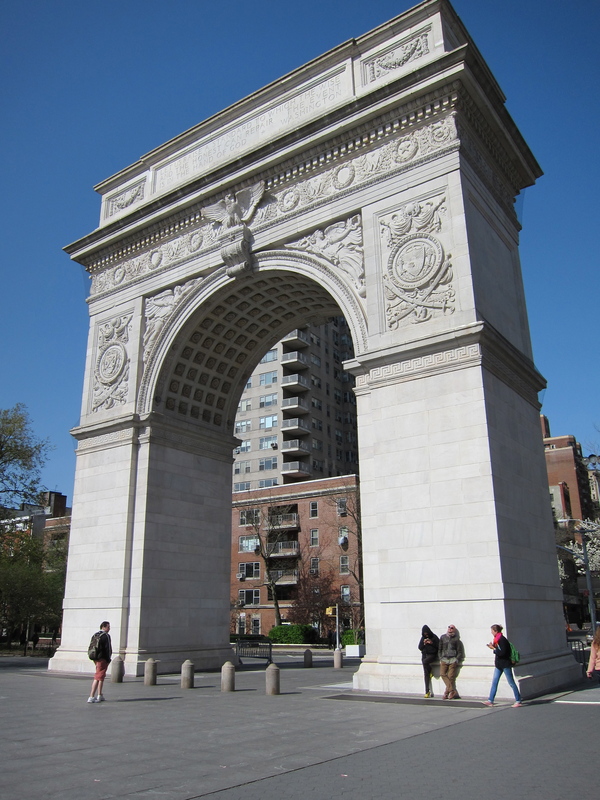 We wandered the neighborhood a bit and I jogged over to Washington Square to take a few pictures of the Washington Square Arch. Then we met our friend, had lunch and checked out some of the unique shops in the area. We ended up at Madison Square Park, the original location of Madison Square Gardens, where we stopped at the famous Shake Shake and had a frozen treat. It was pretty busy in spite to the blustery day. 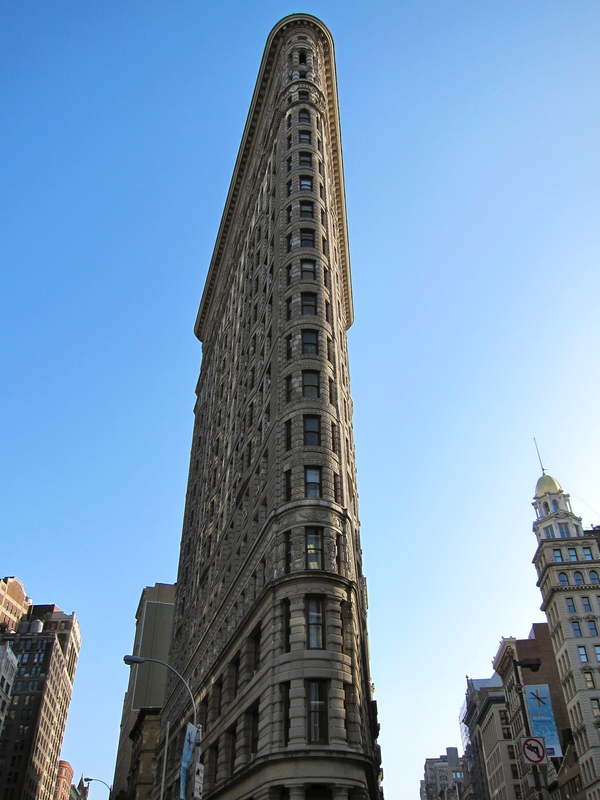 The park is across from the world famous Flatiron Building. 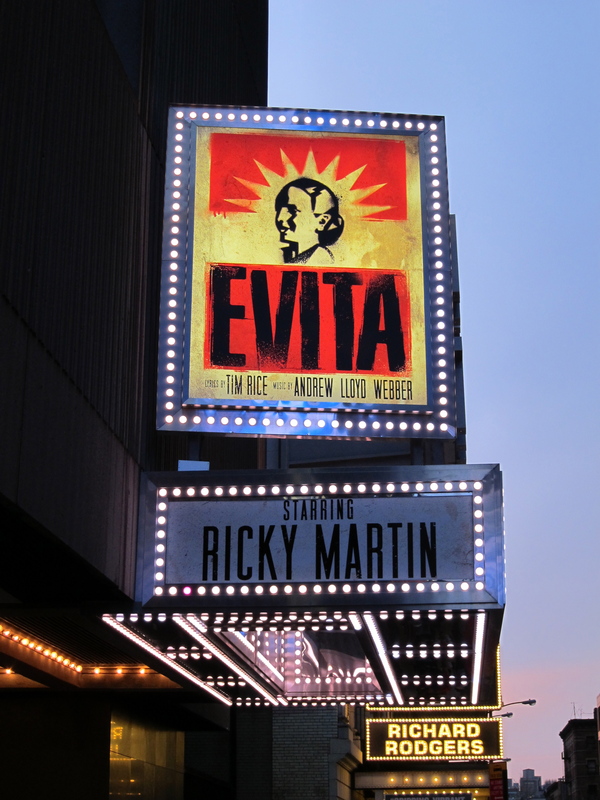 Monday night we saw the revival of Evita which Michael and I had both been looking forward to seeing on Broadway. I could probably go on and on about it –but let’s just say if it gets one good review I will be shocked. In a nutshell, it is miscast, over designed, poorly sound reinforced and poorly staged. There are some nice ‘looks’ but they become repetitive and dull. I have to question the wisdom in many of the characterizations and directing choices that make this production sterile and void of feeling. It felt like the director tried so hard to avoid the original Harold Prince staging that the work was not serviced properly. In this production, there is no connection between Eva and Che, except the brief Waltz for Eva and Che which then makes no sense here. Evita was a huge disappointment and an even bigger waste of money. This is not what I expect to see when ticket prices are averaging $140 a piece. We were both a little slow getting started Sunday morning, but after Starbucks, showers, some blogging and a little wasting time, we finally set out to start our second, three show day. The trouble was… most real restaurants weren’t serving (or open) until noon and we had a one o’clock show. After trying several specific locations and then just searching for anything open… we ended up eating at Chevy’s on 42nd Street. Not exactly fine dining or unique to New York but we were on a schedule and didn’t want fast food. 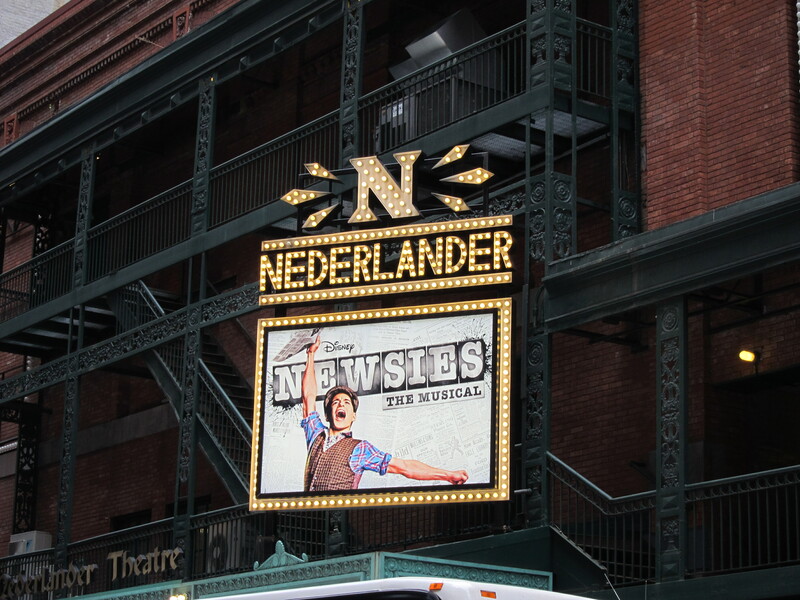 Newsies was one of my choices of shows to see. I remembered seeing the movie years ago and really liking it. Michael wasn’t so enthused about the prospect. He’d never seen the movie, only the Macy’s Parade clip from last year and that didn’t make him eager to see it. The good news is that we both loved it. The choreography and dancing was outstanding, as were all the performers. Afterwards, Michael said, “Why is it that the best shows in New York are the ones I didn’t really care to see?” It’s always hit and miss with shows. We’re pretty easy to please if there is an acceptable level of production values and more than anything… the actors need to at least look like they want to be there. Our middle show was definitely a wild card. After our disappointing Miss Abigail experience the day before, I think both our expectations dropped another notch. 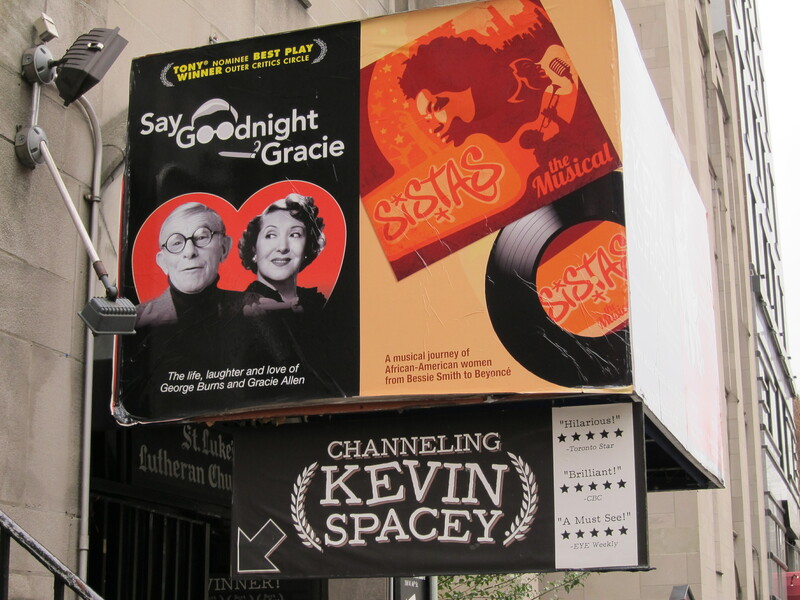 So we trekked over to the west side for the off-Broadway performance of SISTAS The Musical! It’s billed as a story of African American women told through Top 40 music…. From Bessie Smith to Beyonce. I should probably note that Michael and I were two of maybe ten white faces in the audience of mostly 50-something African American women. This excited me because I knew we’d be in for a passionate, vocal crowd. Just before we went in, another white couple showed up in front of the theatre looking a bit confused. The female disappeared briefly and the male said something to another theatre-goer that I didn’t quite hear. Her response was, “Oh no baby, this ain’t Sister Act, this is SISTAS.” (I would have thought the entrance to a church basement would have been a clue.) A little embarrassed, he said, “Oh well, there’s singing and dancing, right? What more do you need than some singing and dancing?” I loved his positive attitude upon learning his mistake. I’m not sure his companion was as cheerful. The show was very entertaining and truly was a musical journey. The plot was thin but just enough to tie together a treasure trove of musical riches. When it came to Whitney Houston’s I Am Nothing, there were audience whisper’s of “Whitney” and the room fell completely silent and became both a solemn tribute and celebratory moment of a woman, whose name wasn’t even mentioned. It was something you would have had to experience. We had a rushed trip from midtown down to the Village to catch my most anticipated show of the trip, CARRIE, The Musical. 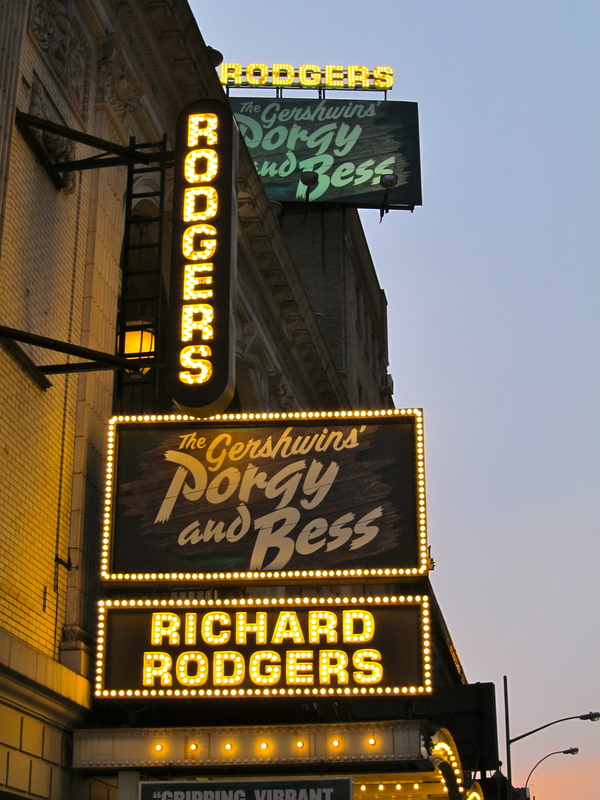 This show had a lot of buzz surrounding it, as the revival of what is considered to be the biggest flop in Broadway history. They re-worked it and made several changes from the original for this production. We made it to the theatre with 20 minutes to spare and Amy was able to join us again. Let’s just say, I think the three of us all had differing opinions, mostly positive, but something different bothered each of us. The big controversy with this production, is the bucket of blood. In case you are not familiar, the musical CARRIE is based on the classic Stephen King horror classic, culminating in the character of Carrie having a bucket of blood dumped on her at her senior prom. In this production, they chose to do it with a lighting effect instead of actual blood. Let’s just say, at our performance, the effect timing was all off and didn’t happen at the right time. So the actress was basically ahead of the effects that were poorly timed or executed. Overall, I loved it as much as I thought I would. Could there be changes? Yes. Was it perfect? No. But I love the bullying storyline, the struggles between mother and daughter ( just trying to survive another day) in their warped view of reality. I was completely engrossed and entertained. My last thought for today’s post goes back a few years. Back in the early 90’s when I would travel to New York by myself, I attended a show in the West Village… and while walking around the streets exploring, I wandered on to a street and suddenly thought, “This is Home.” I can’t explain it, if you’ve felt it before, you know exactly what I’m talking about. It’s something you just know. 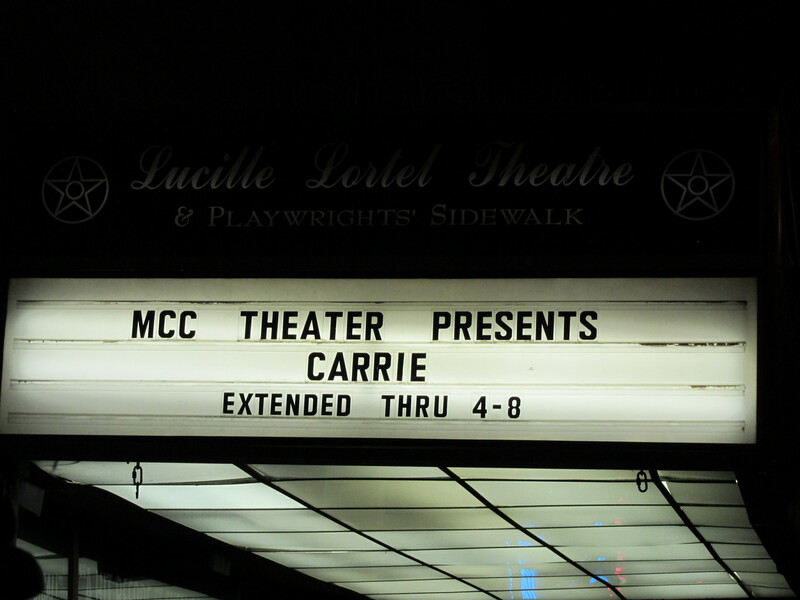 So I took this photo on Christopher Street outside the theater where Carrie was playing. I though I better take a few minutes and post an update since it’s been a week since I last posted. This time of year is extremely always busy and my head is full of “To Do” Lists. Last Sunday night, Michael and I watched the 25th anniversary production of Phantom of the Opera at the Royal Albert Hall on PBS. It brought back the memories of seeing it live for the first time on Broadway back in 1988. It hadn’t been my most anticipated show I would see on that trip (Les Miserables was) but it was thrilling– especially with Michael Crawford and Sarah Brightman. We saw the Las Vegas incarnation last March and it’s no wonder it remains an audience favorite after all these years. 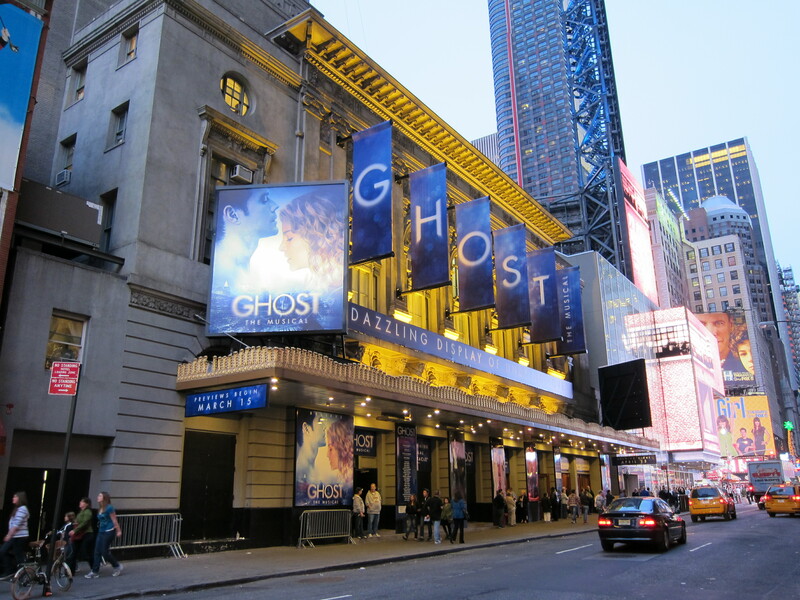 Wednesday night, we went to the movie screening of the Phantom sequel, Love Never Dies. Again, from the short London run, no plans to bring it to Broadway and sketchy reviews, I didn’t have high expectations. It was glorious! Andrew Lloyd Webber’s score is lush and gorgeous. I love the storyline but think if it should make it’s way to Broadway, the first 20 minutes need to be reworked to draw the audience in to the story sooner. 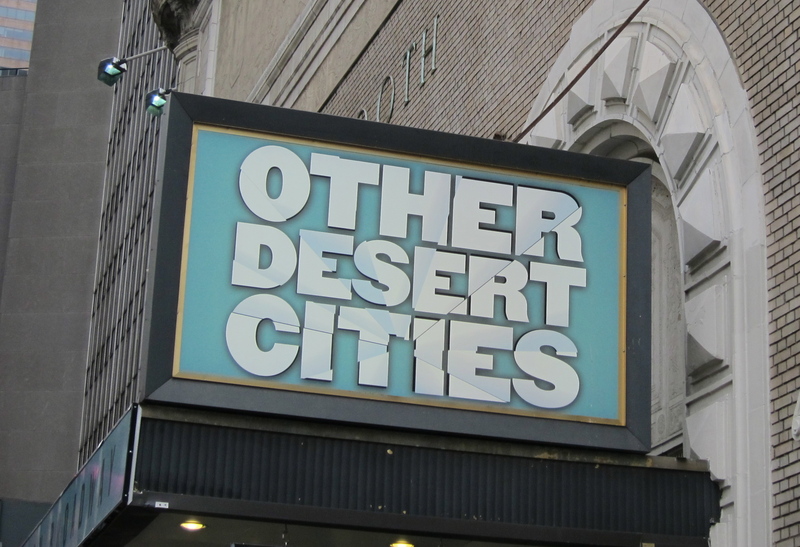 Overall, it is a must-see for theatre lovers. Rehearsals for RAGTIME are moving full speed ahead… great progress is being made and characters are starting to take shape. We have a month to go until opening. I’m hoping to finally have the show’s blocking complete this week. It’s so much more difficult with a cast of 120 than with 40. Three hour daily rehearsals followed by evenings of school events are starting to take their toll on me. I’m off to school now for a full day of set construction. Then tonight Michael and I are going to see the comedian, Fluffy– late night. I see a late afternoon nap coming! 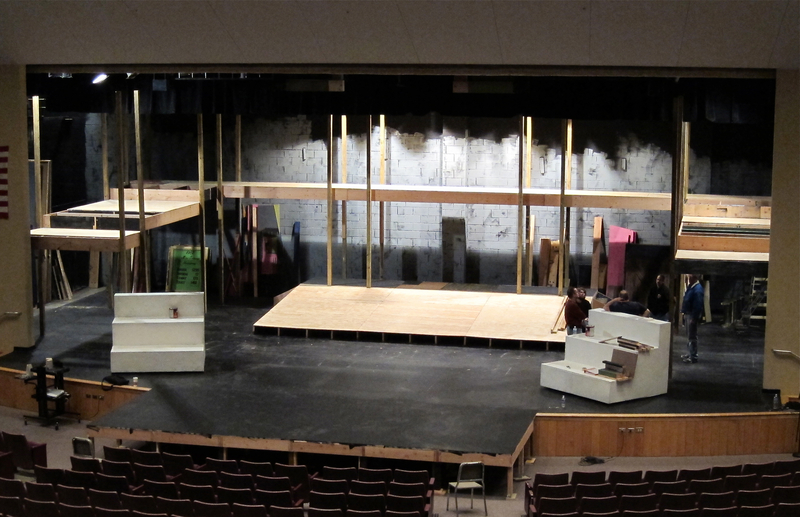 The RAGTIME set in progress. Have you ever attended a football or basketball game where music was not present? In a few hours, my school is throwing together an assembly to send off our girls basketball team to state competition. A great accomplishment, to be sure! In doing so, it was decided to honor our other successful winter sports teams… because to honor one and not the other would not be fair. Our students that recently competed in state speech competition will also be recognized. Notably absent: two students that represented our school by making the All-State Choir and a third student that auditioned and made the All-State Play which was performed for thousands of high school students at the annual Illinois High School Theatre Festival in January. To honor one and not the other would not be fair. Seriously? Are we supposed to believe that statement? The excuse being given is that sports (and speech) are part of the IHSA (Illinois High School Association) and music is sponsored by the IMEA (Illinois Music Educators Association), theatre is sponsored by the ITA (Illinois Theatre Association). All are recognized, if not sponsored, by the Illinois State Board of Education (ISBE). Apparently, IHSA is all that matters at our school. I find it particularly interesting that the IHSA website (http://ihsa.org/default.aspx) header states: The IHSA governs the equitable participation in interscholastic athletics and activities that enrich the educational experience. Then scrolling down the page, one of the top stories is about a band director receiving a national award. I should note that there are no music related associations under the IHSA but by the Mission Statement and Beliefs (of the IHSA), all educational activities are important and deserve equal recognition. By our school’s definition, music and theatre, in which we offer academic classes– are somehow unimportant and do not fit those guidelines. Does the student body know or care about the IHSA? When valuable class time is given up to hold an assembly to honor the best, is it equitable and fair to ignore students that have worked just as hard in their curricular and extra curricular areas of study as others being honored? I say, NO! This is a travesty and is completely unfair and unequal. Honor ALL outstanding achievement or honor none. Is it no wonder that there is an ongoing battle between the importance of athletics and arts or scholastic achievement and recognition? This is not meant to just blast our school’s decision… this happens at schools across the country. Some students are athletes, some are musicians, some are leaders and some are brilliant scholastically. All students need to be applauded for their accomplishments. The kicker is that in this case, the All State Choir students were asked to sing the national anthem at the assembly… but would not be acknowledged for their accomplishments.